Take a look at some of our case studies below. They are from our installations at major sites and with major household brands. We have clients around the world using our photo solutions in theme parks, sporting venues, temporary solutions, Christmas experiences, aquariums and more. You might also like to review our client testimonials. They will give you an insight into what our clients are saying about us, how the photo solutions we supply them with increase revenue and how reliable they are. Some testimonials even compare our solutions with those that they have used in the past and speak highly of the benefits they now enjoy. Winter Wonderland is the largest Christmas Experience in the UK and a great day out for all the family. Located in the heart of London at Hyde Park this free-to-enter family event features a host of festive fun and activities, including ice skating, circus shows, an observation wheel and a huge Christmas market. Image Insight is delighted to once again be chosen as the photo partner for this great event. What could be better than mixing with the rich and famous of today and times gone by? Leaving with a superb Photo Souvenir as a memory of your visit of course! Nothing really worries us when we are installing an operating a photo attraction but we did wonder if we would make it our alive. Winter is a most wonderful time of the year! So this year, why not join us at the Ice-Rink within the beautiful setting of the grounds of the Natural History Museum? In operation from 26th October through to 7th January. There will be no monkey business, when Image Insight supports Blackpool Zoo during their Conservation Evening. Image Insight has provided Blackpool Zoo, with a complete photographic solution since 2014. 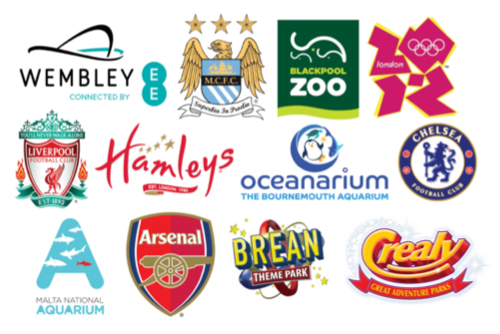 Since taking over, and installing our unique photo solution at the SEA LIFE Hunstanton Norfolk, in 2015, Image Insight and Merlin Entertainments have enjoyed a mutually beneficial partnership. Croke Park, in Dublin, is the headquarters of the Gaelic Athletic Association and one of the largest stadiums in Europe. It has been at the heart of Irish sporting life for over 100 years and is best known as the venue of the GAA All-Ireland Football and Hurling Championship Final. This year 2017 , we are in Cardiff. 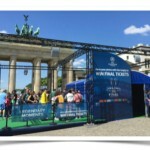 Trophy Photo Experiences have included the Champions League Final Festivals in Cardiff 2017, Berlin, 2015 and Milan, 2016 and on the Trophy Tour Train for the Euros in France, 2016. When given the opportunity to partnership with Crocodiles Of The World (the only Crocodile Zoo in the UK), Image Insight snapped up the chance to provide a unique photo solution. What an honour! With 4 sites around the Olympic Park and over 100 staff, we printed over 65,000 photos using our green screen technology. Our Case Study about the Trophy Tour Train for the Euros in France, 2016. Building on the success in Berlin, 2016 saw us provide UEFA with a solution for the champions league final in Milan. Our photo installation at the prestigious Armoury Retail Store in the Emirates Stadium – the 5th largest stadium in the UK! Plus, our green screen in the Players’ Lounge on the Stadium Tour. Read about our various, Chelsea-themed, green screen photos on the Stamford Bridge Stadium Tours, in the shop and as part of the Christmas experiences. State-of-the-art VEGA photo systems with green screen technology, in Liverpool FC’s Retail Store and the Museum at Anfield Stadium. Our green screen solutions, including photographic services, at the Etihad Stadium Store & temporary solutions at their Market Street Store. We have numerous photo installations at Crealy Theme Park in Devon , including green screen and roving photography. We are privileged to be providing our photo solution in Norway’s largest theme park, on the dark ride, Thor’s Hammer. We provided a themed, chromakey, photography studio, with instant souvenir photos taken by our on-site photographer. The world-famous, London, toy store has a life-sized tube train with our VEGA solution, including a special, grey screen! Enjoy the magic of Christmas with our professional and incredibly beautiful, night-time photos. Sshhh..! Read how we’ve helped keep Father Christmas’s secrets at this award-winning attraction… using iPads! A fabulous Christmas experience for all the family and we DOUBLED their revenue the first year we worked for them! One of Malta’s top visitor attractions! Green screen photography, multiple viewing stations and fish-friendly lighting! Read about our extremely entertaining temporary photo solutions for Nikon. We ensured they were talked about en masse throughout The Photography Show. Another award-winning visitor attraction! We’re recreating ‘that’ Abbey Road photo with our green screen technology. A temporary photo solution at Manchester’s Arndale Centre – ensuring high visitor engagement & brand awareness. 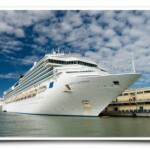 Image Insight takes cruise ship photography to the next level on the high seas. We are proud to have provided our state of the art VEGA souvenir photographic solution to Hyde Park Winter Wonderland over the busy Christmas period. 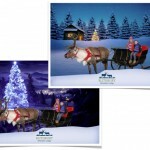 Image Insight provided Christmas Photo Solutions at Blithbury Reindeer Lodge.